QuBAS uses a unique system of CrtV which means no user validation process is required, even for GxP work. Each analysis report is created with its own full audit trail and real time validation record. CrtV was originally developed by Quantics for in house use for GxP analysis. The MHRA inspection auditor described the process as “innovative and elegant” and fully accepted that traditional IQ, OQ, PQ is not required with this process. 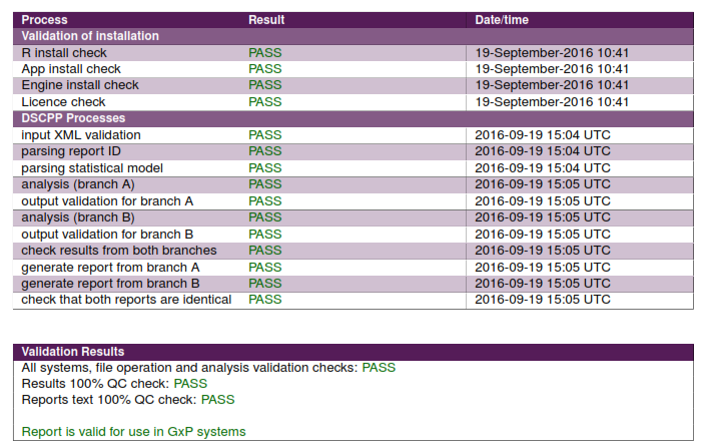 Results are 100% QCd by QuBAS using Diverse Self Checking Pair Programing (DSCPP). The process has to be repeated for every computer, upgrade and any change in other software / hardware. Hidden within QuBAS, the imported data is analysed by 2 completely independent programs. Independently written during development by two different statisticians, in different programming languages, the results are compared, again using a DSCPP process and only if all agree is a report produced. The process validates that Engine A is installed, performing and operating correctly (by comparing with Engine B) and vice versa. It does this using the actual data-set being analysed every time. With CrtV, validation is completed with every analysis, so there is no need for IQ, OQ or PQ because QuBAS takes care of this every time.